Cosmology as a field of astrophysics is concerned with (in the words of Hawking and Ellis) the large-scale structure of spacetime. When related to astronomical observations (such as the gravitational lensing, distant supernovae and galaxies that are discussed in these articles), cosmology relates the times, distances, brightnesses, and angular sizes of observed objects to the overall geometry, topology, matter and energy content in the Universe, and the time evolution of these quantities. and thus other cosmological quantities that depend upon the Hubble constant will contain factors of h as appropriate. defines the redshift of the object in terms of the scale factor. In addition to a measure of time, the redshift is the primary cosmological distance indicator. For a complete discussion of cosmology in the context of general relativity and the cosmography of the Universe, see the texts [A1] and [A2]. In addition to distances, z(t) gives us the age of the Universe as a function of redshift, with best estimates of the current age being 9-15 Gyr. that will asymptotically bring the expansion to a halt in the infinite future, with again denoting its current value. In a cosmology with no cosmological constant, the deceleration parameter takes on a value equal to one-half the density parameter, and so q0 = 0.5 denotes a critical Universe. A popular suite of cosmologicals has a globally flat Universe = 1, with a subcritical matter density < 1 and the remainder taken up in vaccuum energy = 1 - > 0. Technically, this missing energy - could be in the form of matter with an arbitrary equation of state. This has been recently considered in the context of inflationary cosmological models [A3]. We return to the question of and the missing energy problem when we discuss cosmological constraints from lens surveys. Dl = ( 1 + z )2 Da. in which the expansion will decelerate (q0 = 0.5) asymptotically to a halt in the infinite future. Note that in this model the apparent angular size of an object with a fixed physical diameter D will decrease to a minimum at a finite redshift zmin = 1.25, and then will appear to grow larger at higher redshifts (this is just due to the light rays emitted by the ends of the diameter D propagating through the ever slowing expansion of the Universe). Thus, in this model, the inverse function of redshift given angular diameter distance is double-valued. Note that all distances for all models tend toward the simple expression given above for the empty Universe in the limit of small redshift z << 1. Furthermore, all distances are inversely proportional to the Hubble constant, e.g. again for all models. This is the fundamental property of distances we will exploit in determining the Hubble constant from lens observations. which for our Sun translates to an angle of 1.76 arc-seconds for a ray grazing the solar limb. In fact, as the factor of 2 in the deflection is due to the general relativistic effect of the gravitational potential, the observation of the deflection angle in 1917 was heralded as a triumph of Einstein's theory over classical Newtonian gravity. Figure 1 shows the lensing geometry for a typical double-image lens. If the mass distribution, and thus the gravitational potential, is axisymmetric, then the images, lens, source, and observer all lie in the same plane as in the figure. Figure 1. Schematic of image formation by an axisymmetric surface mass distribution. Two images are formed by light rays traveling on the blue and red paths. The blue path is geometrically longer than the red path with respect to the undeviated path directly from the observer at left to the source at right, and also goes through a deeper part of the gravitational potential of the lens. Therefore, the image corresponding to the blue path will be delayed by a fixed amount relative to wavefronts arriving from the image along the red path. The Hubble constant enters through the distances D H0-1. Note that any ratio of two distances will be independent of the Hubble constant. which is proportional to H0-1, but only weakly dependent on other cosmological factors such as the density parameter, through the ratio of the three angular-diameter distance factors. The mass is absorbed into the potential terms. While direct observations of the image positions and relative magnifications can only effectively constrain the Fermat potential (a ratio of mass to distance), the measurement of the time delay can break the degeneracy and yield the Hubble constant. As of early 1999, there are still relatively few gravitational lens systems that have been monitored for variability, and have produced a reasonably robust determination of the Hubble constant. These are the five systems B0957 + 561, B0218 + 357, PG 1115 + 080, CLASS B1608 + 656, and most recently PKS 1830 - 211. All but the last were described in the main article, and further images are linked below. B0957 + 561: This is the original gravitational lens, and has two images of the background quasar separated by 6.1 arc-seconds. B0218 + 357: This gravitational lens system, which was discovered as part of JVAS, consists of two compact radio components separated by 0.335 arc-seconds and an Einstein ring. PG 1115 + 080: The second lens system to be discovered, this system consists of four optical images of a z = 1.722 QSO. CLASS B1608 + 656: This system has four compact radio components, as well as an infrared Einstein ring. 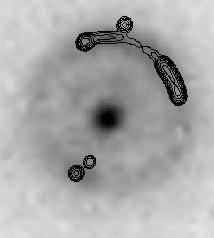 The image geometry and flux ratios are not well fit by a single-lens model, and HST images show the lensing galaxy to have two brightness centers, consistent with it being a binary galaxy lens [A4]. and thus this system becomes the fifth lens to produce a solid Hubble constant determination. Below is shown perhaps the best example of gravitational lensing with a nearly complete Einstein ring. The JVAS lens B1938 + 666 [A7] shows both compact multiple images and extended arcs in the high-resolution radio image taken by the MERLIN interferometer. The HST infrared NICMOS image, on the other hand, shows the lensing galaxy plus the background galaxy distorted into a circular annulus. This is an example of a lens system with nearly perfectly alignment along the observer lens source axis! Should the compact components prove to be variable, the large number of constraints upon the lens gravitational potential by the arcs and ring would make this an important system for cosmology. There are several other CLASS lenses that are undergoing scrutiny for possible variability, and thus are time-delay friendly. The 1.39 arc-second double CLASS B1600 + 434 (left) [A8] (right), which has the distinction of having an edge-on disk galaxy as a lens, was monitored with the VLA during 1998 and significant variability was detected. The newly discovered lens CLASS B1152 + 199 [A9] is a 1.6 arc-second double, and has a flat radio spectrum indicative of probable variability. What sets this system apart, however, is that it was detected in x-rays by the ROSAT satellite, and thus is an excellent target for monitoring by AXAF (due to be launched in 2000). 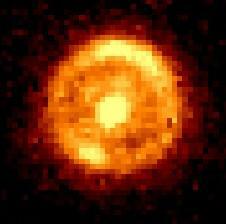 The spectacular 10-image system CLASS B1933 + 503 [A10] (consisting of a triple source imaged into two quads and a double) has an inverted-spectrum core which is split into four images, and was also monitored in 1998. The advantage of this system is that the number of constraints available from the ten images, as well as any measurable substructure in the images, should strongly constrain mass models. The final lens shown is the CLASS quadruple image system B1359 + 154, [A9] which was discovered in 1998 in the latest phase of CLASS. In addition to the classic quad morphology (components A - D), emission is also seen from the lensing galaxy itself (components E - F). Furthermore, CLASS B1359 + 154 is like CLASS B1608 + 656 in that the best-fit lens model has two distinct mass components, and single deflector models cannot sufficiently reproduce the observed component configuration or brightnesses (even with an external shear term added). See also the CASTLES web page for an extensive gallery of optical/IR observations of lens systems. We note that there are other systems with reported time delays, or that are being monitored for variations, but have missing information (such as the redshift for one or more of the components). These, as well as newly discovered lenses, are sure to produce important information on the Hubble constant and the cosmology of the Univere in the near future. http://www.livingreviews.org/ available in purely electronic form. for article abstracts as well as for astronomical observations. I wish to thank my graduate student David Rusin for letting me nab his succinct summary of the mathematics of lensing. I would also like to thank him and all the other members of CLASS (especially the graduate students Leon Koopmans and Chris Fassnacht) for allowing me to showcase our work in this perspective. I would also like to thank ahead of time all of my colleagues in this field whose work I have left out for having forebearance with my peculiar choices for referencing. Due to the nature of this article, I have only referred to a few key, topical, or representative papers on the various facets of lensing. Caveat emptor. [A1] Peebles, P. J. E. (1993) Principles of Physical Cosmology (Univ. Press, Princeton). [A2] Weinberg, S. (1972) Gravitation and Cosmology (Wiley, New York). [A3] Caldwell, R. R., Dave, R. & Steinhardt, P. J. (1998) Phys. Rev. 80, 1582-1585. [A4] Fassnacht, C. D. (1998) Ph.D. thesis (California Institute of Technology, Pasadena, CA). [A5] Lovell, J. E. J., Jauncey, D. L., Reynolds, J. E., Wieringa, M. H., King, E. A., Tzioumis, A. K., McCulloch, P. M. & Edwards, P. G. (1999) Astrophys. J. 508, L51-L54. [A6] Lidman, C., Courbin, F., Meylan, G., Broadhurst, T., Frye, B. & Welch, W. J. W. (1999) Astrophys. J. Lett., in press. [A7] King, L. J., Jackson, N. J., Blandford, R. D., Bremer, M. N., Browne, I. W. A., de Bruyn, A. G., Fassnacht, C., Koopmans, L., Marlow, D., Nair, S., Wilkinson, P. N. (1998) Mon. Not. R. Astron. Soc. 295, L41-L44. [A8] Jackson, N., de Bruyn, A. G., Myers, S., Bremer, M. N., Miley, G. K., Schilizzi, R. T., Browne, I. W. A., Nair, S., Wilkinson, P. N., et. al. (1995) Mon. Not. R. Astron. Soc. 274, L25-L29. [A9] Myers, S. T., Rusin, D., Fassnacht, C. D., Blandford, R. D., Pearson, T. J., Readhead, A. C. S., Jackson, N., Browne, I. W. A., Marlow, D., Wilkinson, P. N., et al. (1999) Astron. J., in press. [A10] Sykes, C. M., Browne, I. W. A., Jackson, N., Marlow, D., Nair, S., Wilkinson, P. N., Blandford, R. D., Cohen, J., Fassnacht, C. D., Hogg, D. W., et al. (1998) Mon. Not. R. Astron. Soc. 301, 310-314. [A11] Schneider, P., Ehlers, J., & Falco, E. E. (1992) Gravitational Lenses (Springer, New York). [A12] Blandford, R. & Narayan, R. (1992) Annu. Rev. Astron. Astrophys. 30, 311-358. [A13] Bernardeau, F. (1999) in Theoretical and Observational Cosmology, ed. Lachieze-Rey, M., in press. [A14] Munoz, J. A., Falco E. E., Kochanek, C. S., Lehar, J., McLeod, B. A., Impey , C. D., Rix, H.-W. & Peng, C. Y. (1999) Astrophys. Spa. Sci. [special issue: Proceedings of the III Scientific Meeting of the SEA (Spanish Astronomical Society), guest eds. Gorgas, J. & Zamorano, J. ], in press.